This Minnesota duo creates a nice bit of atmospheric drone utilizing guitar, bass, keys, and other random noises. Although there are ten tracks listed on the back Lullaby plays as one piece, and has simply been tracked into ten parts for ease of jumping around, maybe for radio play? Apparently they decided to abandon their familiar instruments and switch to instruments they had no experience playing in order to come up with new and fresh approaches to drone making. Did they succeed? Well, I have heard a boat load of “dronescape” records over the last five years or so, and I can not really say that what If Thousands presents here really sounds all that much different from much of the Kranky Records discography. It starts out with a gently swelling tone, layers gradually get added on, some distant, echoed voice appears, then fades away. Like most ambient records, it doesn’t really travel to far from the starting point, but that really isn’t the point with this kind of stuff is it? 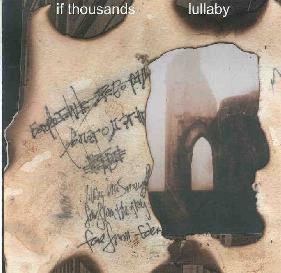 Lullaby is a very pleasant listen, it holds up quite well to repeated bath tub/couch/recliner/sleep listens. What more is there really? If you dig ambient drones you will like this.